Why rent wedding table runners when you can buy them for a cheaper price? 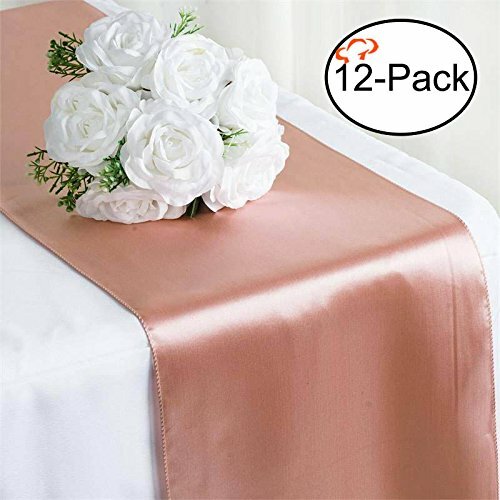 Add this stunning satin table runner to your table décor for an elegant and sophisticated look! This table runner is ideal for weddings, anniversary parties, graduations and other special occasions or events. Make your party decorations shine when you add this silky-smooth runner on your table top. It's a great way to make your centerpieces and candles pop! Satin has an unsurpassable sophistication and charismatic appeal, making it undoubtedly the most preferred fabric adored by people all over the world. It is used in designing elegant formal attires, accessories, decorative flowers, ornaments and a lot more. The lustrous glossy texture of the fabric together with the seamless sheen and sublime elegance it exudes make it everyone's favorite. Spreading charm atop your colorful or plain table covers, these lustrous table runners will upgrade your event's ambiance. Long enough to fit rectangle and round tables, it could also be used as chair cover sashes or decorative wraps. - Measurements: 12" wide x 108"
-Seamless, 1 pc design. Edges are serged. - Hand wash only. Hang dry, don't use dryer. Tiger Chef is your ultimate party store! From upscale elegant tablecloths to disposable cutlery. Look for Tiger Chef Party Supplies on Amazon. - Wrinkle- Free: Tiger Chef's Table Runners are wrinkle free creating an inviting ambiance to your party, wedding, engagement, graduation, banquet etc.